If great graphics, smooth game play and a modern theme appeal to you, you will love playing these new horse games. Great for the girl who is looking for a mix of adventure, challenge and intrigue. 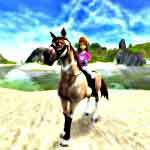 When you play these online horse games you will feel as if you have escaped to a different world where you get to make big decisions, meet interesting people and take part in high adventure. The great thing about many of these new horse-riding games is that many are inexpensive or totally free.